The tent is a wooden floor with carpet. Outside is a large wooden picnic table and a private fire took place which can be cooked and grilled. Sufficient wood is provided. It is an ideal place for people who love peace, nature and keep walking. In the National Park (which unfortunately no dogs allowed) can marmots, ibex, chamois, roe deer and deer can be seen. The eagle has its nest and above the campsite regularly flies the bearded vulture. I will be present at your arrival at the campsite to transfer the caravan clean and tidy. Also at the inspection post I will have to take the key. 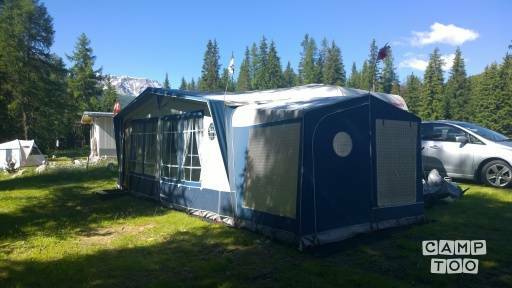 When renting must be paid per person camping fee plus tax and of course power. Smoking is not allowed, a dog is welcome. At the campsite, the dog must be leashed. For children, the caravan less suitable. You can pick up the caravan in Borger at L.